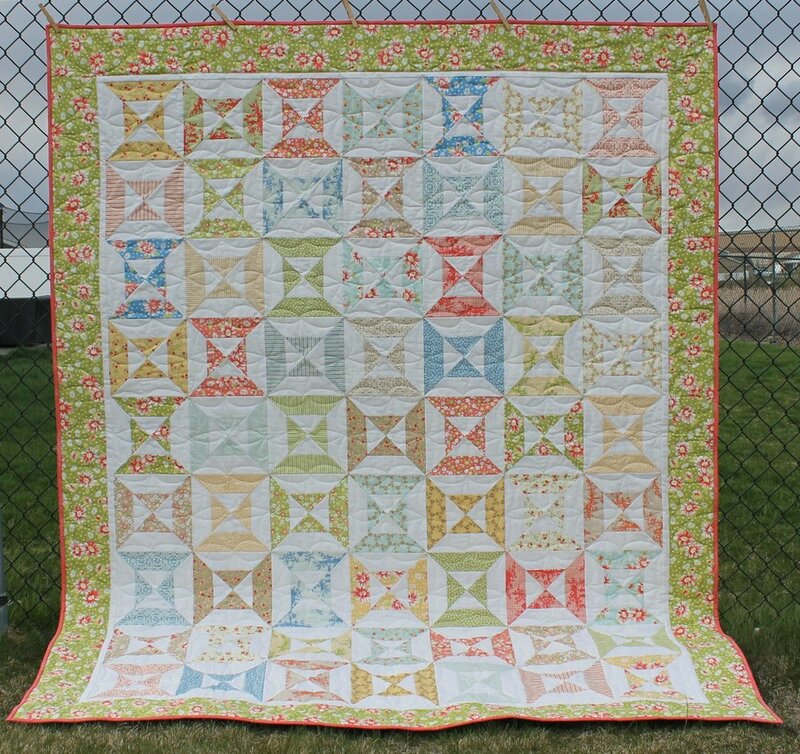 California Girl Hourglass - a Finished Quilt! This is what I affectionately call my deployment quilt. And by affectionately, I mean...not very much at all. 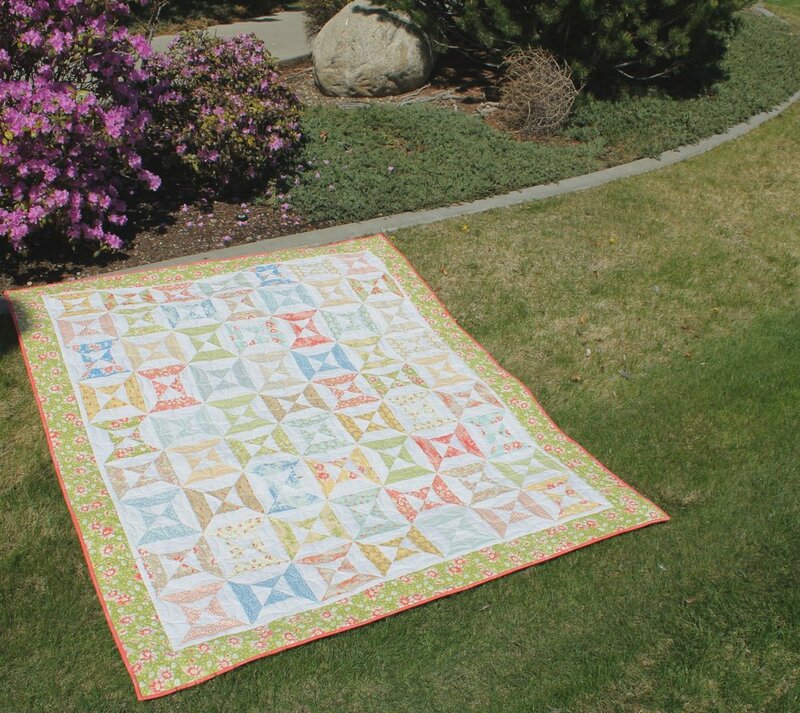 The jelly roll was purchased in 2012, when we were living in California for training before my husband's long deployment. Most of the blocks were pieced in the summer of 2014, during another deployment. And now that he's deployed again, I figured it was about time to finish it off! 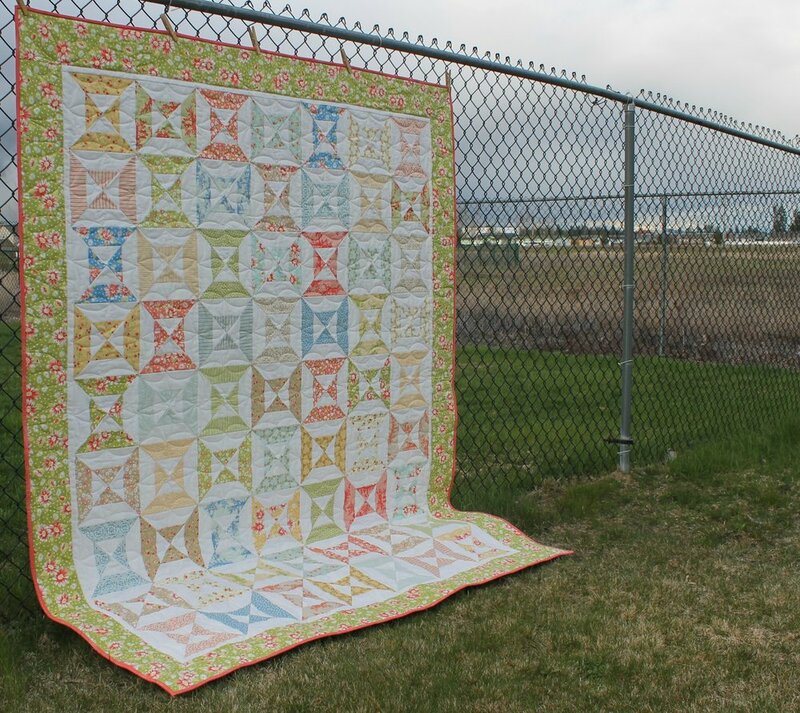 The pattern is Cluck Cluck Sew's hourglass. There's certainly plenty of ways to do these, but this was the tutorial I used. Although I have a triangle ruler, so I used that instead of a template. 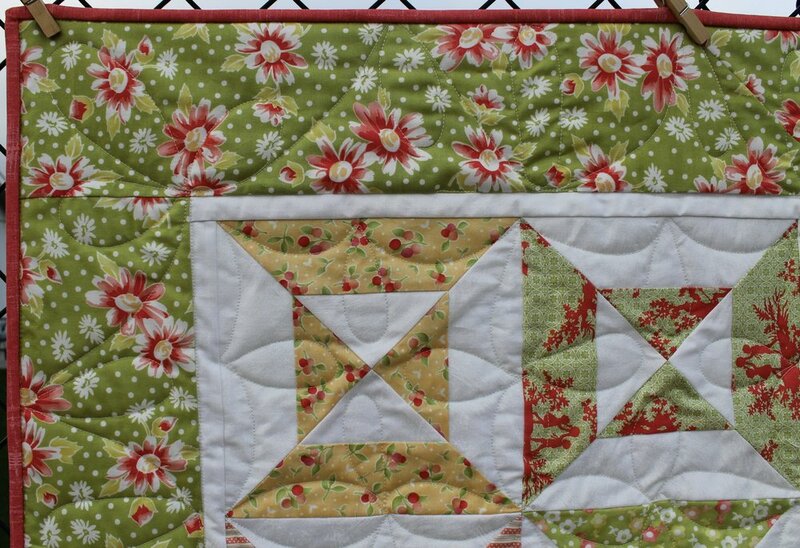 The fabric is Fig Tree's California Girl. It is, of course, long out of print, but the new Coney Island is a near match. In fact, I considered one of the corals in Coney Island as binding, but I found something in my stash instead. 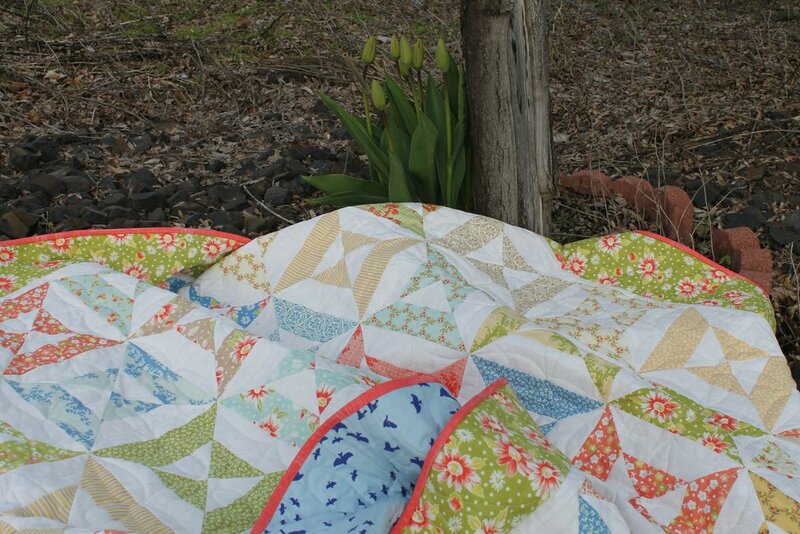 The quilting is more block and border work from Pam Clarke's books. It's freehand so it's a bit imperfect, but it looks great overall. And it was fairly easy to do! The backing is Nature's Palette from Free Spirit. And even though the binding and the white were purchased years apart - they're both Painter's Canvas by Laura Gunn! I debated a more boring green/blue binding that would match the backing, but Instagram overwhelmingly voted for the coral. And they were right. Tried to take some flower pictures, again, but my tulips are refusing to cooperate, AGAIN. We had a snow flurry yesterday morning - can you blame them? I don't think we're going to have spring at all, at this rate. So I took the Little Man to a playground after therapy, for the sole purpose of scouting out photo locations. Of course, expecting the three-and-a-half foot member of the family to help in photoshoots is a little unrealistic. In fact, he pretty much drank his juice box and then complained that I was taking too long. 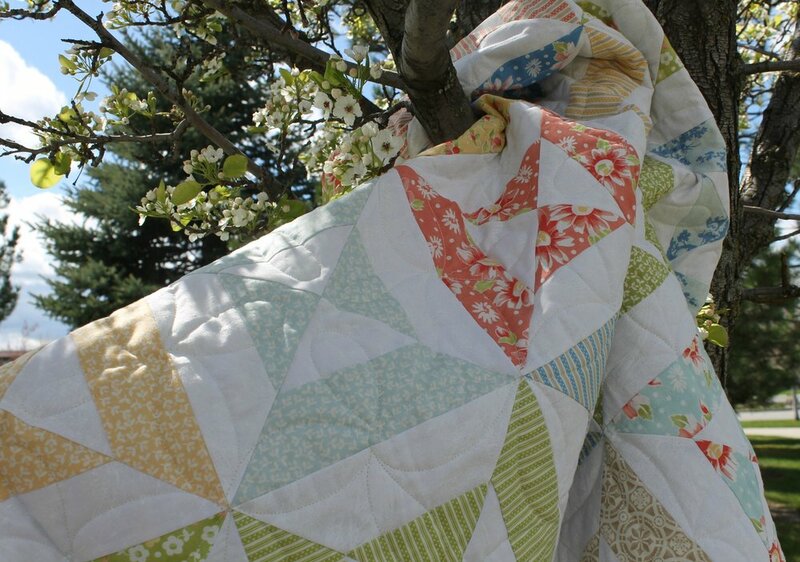 And then the quilt fell out of the tree. So, yeah. I'm trying! But sometimes the backyard is just easier.